With more than 42 years bench experience as an in-house repair facility, founder and owner Steve Bockus considers band instrument repair to be a largest part of his business -- not just a side line. As the only instrument repair shop in the immediate area, the turn around time on most repairs is two to three days or less. It is recommended that instruments be serviced each year to maintain optimal playing condition and your instrument will play better and last longer. 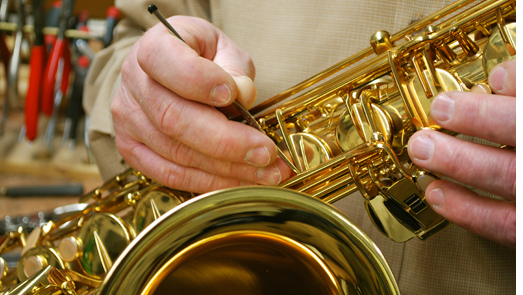 Woodwind repairs may include head cork, tenon cork, neck cork, or key cork replacement; pad replacement from one pad to a complete repad; spring replacement; bent or sticking keys; loose posts or rings; adjusting or regulating the action; grafting tenons or receivers; tone hole work; pinning and filling cracks in woodwind bodies. Brass repairs may include stuck mouthpieces or slides; valve or valve casing repair; straightening or aligning trombone hand slides; adjusting valves; restringing rotary valves; soft soldering; silver soldering; dent removal; spot lacquering; complete factory restoration. We repair cases and also sell replacement cases. We appraise instruments for insurance purposes. While it is possible to give a "ball park" estimate as to the cost of a repair over the telephone, it is always advisable to bring the instrument in for examination. That way a more accurate estimate can be given.